With a Democrat-led House coming to town, Washington is ready for very tough negotiations on the next and final budget deal of the Budget Control Act. But that’s missing the forest for the trees. No matter how much money the Pentagon gets, the president’s budget for next year is still flat or declining. Contrary to the president’s rhetoric, there is no forthcoming Trump buildup, and the new strategy emphasizing China and Russia is becoming ever more elusive and out of touch with fiscal reality. It is simply unaffordable at this point in time. The last bipartisan bargain in 2018, which dwarfed the two previous deals combined, cost $185 billion on the defense side and $131 billion on the non-defense side for a total of $286 billion. Compare that to the likely president’s budget request for the Pentagon alone next year and the odds quickly look long. 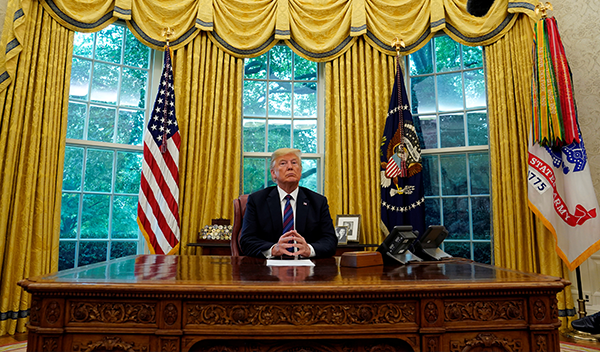 Funding the president’s original projected budget of $733 billion in fiscal 2020 and $743 billion in fiscal 2021, plus a large “base-to-OCO” transfer will require $270 billion. It is nearly unimaginable that a newly empowered House Democratic majority will not open negotiations by demanding pure parity for defense and non-defense discretionary increases. That tab quickly grows too big to swallow, even for deficit-loving, free-wheeling big spenders in both parties on Capitol Hill. With inflation rising and annual deficits bumping up close to a trillion dollars, members are starting to get squeamish about large, unfunded new bills. This comes as the Congressional Budget Office projects that continued deficit spending will take the amount of federal debt held by the public to roughly 100 percent of GDP by the end of the 2020s. Even if leaders can agree on and ram through a massive deal, those levels of defense spending are part of the flat five-year spending plan advanced by the Trump Administration. A defense budget that roughly keeps pace with inflation means that the military loses buying power. While it sounds like insider accounting, this has serious implications for those in uniform, especially for readiness. So, while the administration’s proposed increased from a $716 billion defense budget in 2019 to a $733 billion defense budget in 2020 sounds hefty and generous, the Pentagon will not be able to buy any more than it did the last year—assuming inflation hangs around 2 percent. A flat defense budget is unacceptable to enough members of Congress to keep a deal with less money from passing. President Trump’s disappointing investment plans have been panned by a bipartisan cast of defense experts who have pilloried the idea that such a spending profile could fund a true “buildup” that would not only reverse the damage to the military of the past two decades, but better posture the United States for long-term great-power competition. Most recently, the congressionally-mandated Commission on the National Defense Strategy highlighted the chasm between the lofty goals laid out in the administration’s National Defense Strategy and the money to back it up. Rather than a topline ask of $733 billion in 2020, the 3 to 5 percent real growth called for by the commission would generate a 2020 topline of $752 billion to $766 billion. The difference would only grow larger in fiscal 2021 and beyond, like compound interest. As if it weren’t enough that $733 billion was too little to provide for the common defense of America and meet the Pentagon’s own stated objectives and requirements, the administration now would like defense to absorb a 5 percent spending cut in 2020. While much remains unclear about the specifics, officials’ comments seem to indicate that the defense topline request will likely be $700 billion not $733 billion in 2020, a loss of $33 billion from a budget that should have been at least $30 billion higher to begin with. Why is the Trump Administration doing this? Because scoring political points about the deficit and debt while doing nothing to solve that problem is easy. If you listen closely, when you hear National Security Adviser John Bolton say that “right now you can have significant impact on both the deficit and national debt by cutting government spending on discretionary programs,” you can almost hear an echo of the bipartisan coalition of President Obama and GOP fiscal hawks who passed the Budget Control Act together in a laughable attempt to balance the budget (largely) on the back of the military. But if the original BCA has been such a great idea, why has it been revised every single budget year since? The truth is politicians want it both ways—to be seen as cutting overall federal spending and growing spending on individual priorities and programs when they can. But there isn’t likely to be any growth in defense spending. Simply financing a flat defense budget of marginal growth for the next two years will be a tall hill to climb for the new Congress. Pentagon planners can hope for better but plan for another 2013, when sequestration kicked in after years of promises it wouldn’t.